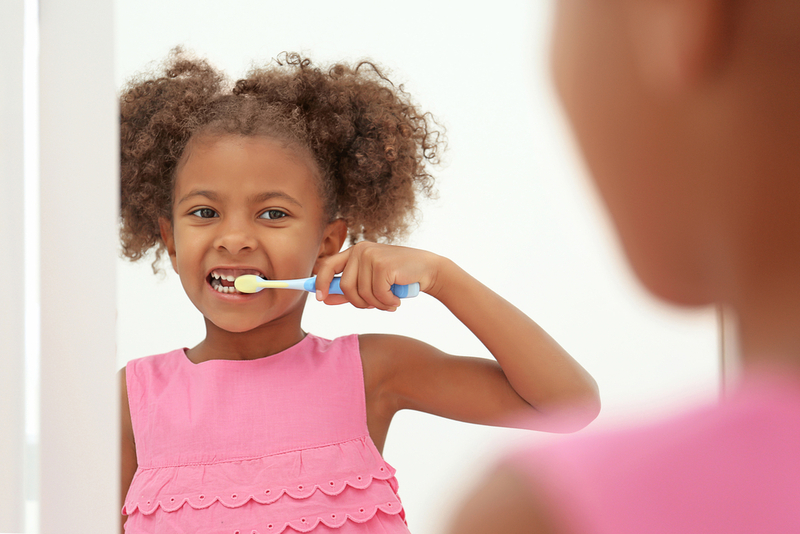 When Should I Change My Child's Toothbrush? - Adelberg Montalvan Pediatric Dental PC & Orthodontics too! Sterilizing your toothbrush routinely and changing it when it is necessary is crucial to practicing a good oral hygiene. Our children may not realize the harmful effects of poorly kept toothbrushes, so it is necessary for us parents to manage their hygiene equipment ourselves. As parents, we must educate ourselves regarding professional dental recommendations for oral care and toothbrush replacement. According to the American Dental Association, a toothbrush’s maximum use should not extend beyond three months, i.e., it should be replaced every 3 months. However, this recommendation is mostly concerned with the toothbrush’s brushing quality reducing with time than the building up of bacteria in the toothbrush. Toothbrush bristles wear out over a period of 3 months, which reduces its strength to properly remove plaque from our teeth. With children, our concern shouldn’t only be about a toothbrush’s wear and tear but also about its proper cleaning over shorter periods of time. One of the reasons why children’s toothbrushes require replacement more often is because their brushing practice may be more rough and improper than ours, which can cause the toothbrush bristles to spout out. The quality of our brushing is, therefore, one of the main factors that determines the right time to replace our toothbrushes. – Rinse the toothbrush vehemently under the hot water after brushing. – Store it in a position that is upright so that it easily dries out before being used again. – Store toothbrushes at a distance from one another, so that they don’t come into contact. – For meticulous germ protection soak toothbrushes in mouthwash or in a diluted solution of hydrogen peroxide (using a 50:50 ratio of water and antiseptic). – Sterilize the toothbrushes in boiling water. – Ditch the toothbrush after the child has been sick with flu or any illnesses. Essentially, bacteria can remain thriving in the bristles and can potentially re-infect children. If replacement isn’t possible at the time, we should make sure the toothbrush is thoroughly cleaned and sterilized before being used again. We should get into the habit of changing toothbrushes for everyone in the family several times. The frequency of changing depends on the factors discussed above, but a general recommendation for adults doesn’t extend beyond 3 months. You can schedule routine dental checkups to ensure there isn’t any decay occurring in your children’s oral health. Adelberg Montalvan Pediatric Dental is a pediatric care provider for children. We take pride in our highly trained and experienced services. Contact us today!